Booking your accommodation in a mountain hut in advance is always a good idea, especially if you are heading to one of the more popular regions, if it is high season or if you expect to arrive late. You can either contact the hut warden directly, or book via the nearest tourist information centre in the valley. Most of the larger places will to be open from early July to the middle of September, but this does vary according to country and to weather conditions. In the event of your plans changing, it is important that you cancel any reservations you may have. If not, then you will still be charged a “no show” fee. Each hut has its own terms and conditions, so you should check these out at the time of booking. Alpine hut accommodation, although very basic, can be relatively expensive in some areas, so if your hut to hut in the Swiss Alps, Austria, Germany's Bavaria or the Italian Dolomites & South Tyrol region involves a number of nights, you might benefit from joining the British Mountaineering Council (BMC) and buying a ‘Reciprocal Rights Card’, which will grant you discounted rates in those huts which are owned by the National Alpine Mountaineering Federation (which incorporates the Alpine Clubs of Switzerland, Italy, Germany, South Tyrol and Austria). These discounts are usually between 20% and 50% less than the published rates. While there is a charge for this card, it’s likely that you’ll save overall if you are planning on several overnight stays. Alternatively, you can always join one of the Alpine Clubs listed below to benefit from reduced rates on overnight stays, although food and drink are not eligible for discounts. Indeed, it may work out cheaper to join the Austrian Alpine Club (AAC) - which has a UK branch. 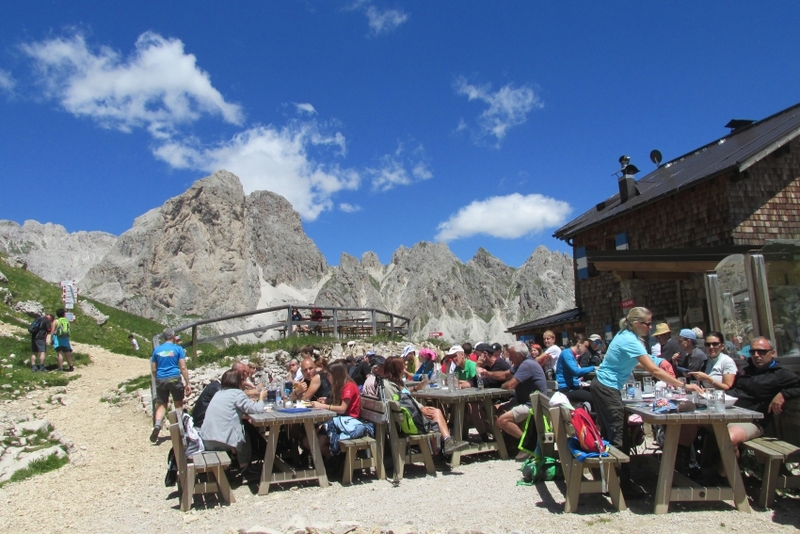 The AAC’s membership card can also be used to access reduced rates in all Alpine huts, except for those which are privately owned. By becoming an AAC member, you will also receive automatic insurance for mountain rescue, medical treatment and repatriation worldwide. One of the greatest benefits of joining an Alpine club is that a hut will be obliged to accommodate you overnight, even if it's officially full (even though this probably means a night on the floor!). If you are travelling with your children, it is worth noting that family memberships are available, too. When it comes to payment, some but not all will accept credit cards – do check ahead about payment methods. You are also advised to find out in advance whether your chosen mountain huts have any provision for food, as this really does vary from hut to hut.